When you think of a pet parrot, you probably picture a giant colorful macaw or a talking African Grey. The truth is, however, that there are hundreds of different species of parrot and many of them make great pets. The more you learn about parrots, the more you will be amazed by them, and that doesn’t even compare to the joy of keeping one for yourself! When it comes to caring for your pet parrot, you’ll need to consider its needs for space, enrichment, and nutrition. Keep reading to learn the basics about choosing a healthy diet for parrots and to see our top picks for the best bird food for parrots. 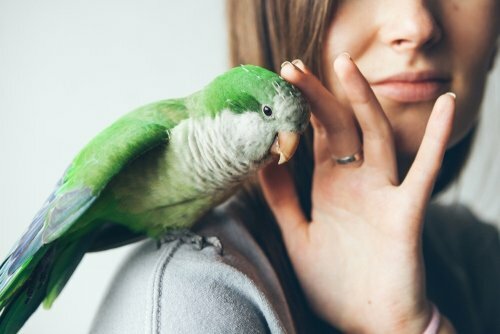 What Do You Need to Know About Parrots? How Much Should You Feed Your Parrots? How Many Times a Day Should You Feed Your Parrots? There are more than 350 different species of parrots on Earth, and they come in all sizes and colors. When it comes to companion parrots – parrots kept as pets – sizes generally range from 5-inch lovebirds all the way up to 40-inch macaws. When it comes to the ideal diet for parrots, it depends to some degree on the species. Most parrots eat a combination of seeds, fruit, nuts, vegetables, and other foods in the wild and many commercial diets approximate that combination of ingredients. Another option is to choose a commercial pellet that is nutritionally complete and balanced in each bite, then supplement it with small amounts of fresh fruits and vegetables as well as seeds. In addition to providing for your parrot’s nutritional needs, you also need to make sure he has plenty of space and an enriching environment. Because parrots range in size, you’ll need to do some research on your parrot’s species to see how much space it needs and what kind of toys are best. Because there are many different species of parrots, you need to be careful about choosing the diet that is right for your bird. Some bird foods are designed for parrots of different sizes (small, medium, or large) while others are formulated for specific types of parrot. Be sure to do some research about your parrot to see which type of diet is recommended by veterinarians. Species-Specific Recipe – If you want to make sure that your parrot is getting the best nutrition possible, choose a species-specific recipe rather than a bird food designed for a certain size bird. Variety of Ingredients – Parrots eat a widely varied diet of fruits, vegetables, seeds, and nuts in the wild so you should look for a bird food that is made with a variety of different ingredients. Complete and Balanced – An alternative to a varied blend of seed and other ingredients would be a commercial pellet that is complete and balanced for parrots. No Artificial Additives – In addition to checking that your parrot food contains healthy ingredients, you should also make sure it does NOT contain artificial colors, flavors, and preservatives or other chemical additives. Keep reading to see our top 5 recommendations for the best bird food for parrots. The ideal diet for your parrot will depend on the type or size of parrot you have. All bird foods are not created equal, and you have to choose the one that is best for your bird. Some parrots do well on a commercial pellet that is nutritionally balanced while others prefer fruit, nut, and seed blends. You may have to try several options before you find one your parrot likes. 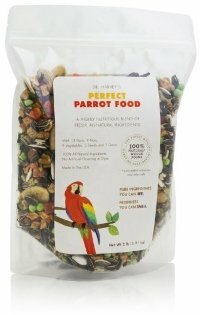 If you have a large parrot, this Dr. Harvey’s Perfect Blend Natural Food for Large Parrots is a great choice. It features a varied blend of fruits and vegetables as well as seeds and nuts to provide balanced nutrition as well as enrichment for your parrot. It contains no chemicals, dyes, or artificial preservatives and is optimally balanced for daily nutrition. This formula contains foods your parrot would naturally find in the wild, so it is close to its natural diet as well. Uniquely formulated for conures, this bird food is a nutritionally complete daily diet. 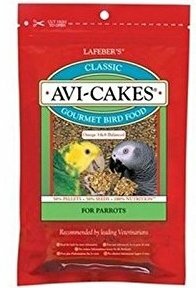 This Lafeber’s Classic Nutri-Berries Bird Food and Treat for Conures offers the balanced nutrition of commercial pellets but comes in an inventive cluster design to appeal to your conure’s desire to forage and play. It contains a nutritious blend of natural ingredients to provide balanced nutrition like traditional pellets but in a more enriching form. You can offer it as a complete daily diet or as an occasional treat for conures. 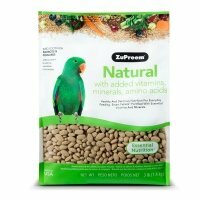 If you’re looking for a healthy and balanced diet for medium-to-large parrots like conures, Amazons, and African greys, try this ZuPreem Natural Medium/Large Bird Food. This formula features all-natural ingredients in a complete and balanced recipe to ensure optimal nutrition in every bite. It contains added vitamins, minerals, and amino acids to support your parrot’s whole-body health as well as vibrant plumage. It is highly nutritious, full of delicious flavor, and easily digestible because it comes in the form of extruded pellets. Simply put, it makes for an excellent daily diet you can easily supplement with treats. 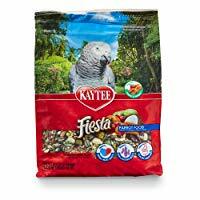 If you want to provide your parrot with an enriching variety of flavors and textures, try this Kaytee Fiesta Bird Food for Parrots. This bird food consists of a wide variety of seeds, nuts, fruits, and veggies that will appeal to many different parrots. It is complete and nutritionally balanced for daily feeding but provides more enrichment than a commercial pellet. Plus, it contains prebiotics and probiotics to ensure healthy digestion with omega-3s for vibrant plumage. Parrots tend to be active and intelligent birds, so you should provide a diet that is complete and balanced but also enriching. 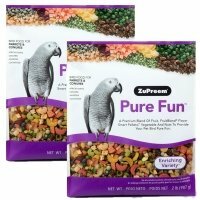 This ZuPreem Pure Fun Enriching Variety Parrot Food is a great choice because it is uniquely formulated for parrots but also provides the bird with fun and exercise. This particular product includes a varied blend of fruit, smart pellets, vegetables, and nuts to ensure complete and balanced nutrition while also appealing to your bird’s foraging desire. Plus, is it fortified with vitamins, minerals, and amino acids for optimal health. The amount you feed your parrot varies depending on the type of parrot you have and its size. Small parrots may eat up to ¼ cup of pellets per day supplemented with 1 to 2 teaspoons of seed. If you’re not sure how much to feed your parrot, purchase a bird food designed for the size of parrot you have and refer to the feeding instructions. Most birds tend to eat small amounts throughout the day, so plan to provide a day’s worth of food for your parrot about once a day. It is important to thoroughly clean the feeding dish before you refill it and to always provide plenty of fresh water. If you have more than one parrot, you may need to refill the food dish during the day or provide two dishes. The perfect bird food for one parrot may not be the right choice for another parrot. You’ll need to think about the type or size of parrot you have and choose a bird food accordingly. Remember, you also need to take your bird’s preferences into account – you may have to try several options before you find one your parrot likes. If you’re not sure where to start shopping for parrot food, try one of our top 5 picks reviewed above!